Effortlessly get your mixes radio and streaming-ready with Ozone 7 Elements. 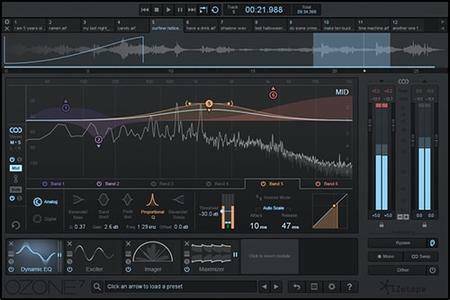 With best-in-class processing from Ozone 7, this new mastering plug-in enables you to achieve a full, rich, and loud final master with professionally crafted presets and simple macro controls to shape your sound. With professionally designed, goal-oriented presets and simple, high-impact macro controls, it’s never been easier to achieve a final mix with the sonic impact and energy of songs from your favorite albums. Start by selecting a preset. Each preset contains a complete mastering chain designed to bring your tracks up to radio-ready quality. Choose from Genre-Specific, All-Purpose, or Artist Signature presets to zero in on your desired aesthetic. Ozone 7 Elements includes processing from Ozone’s most popular module - its legendary Maximizer. Ozone’s Maximizer has been used by top mastering engineers the world over to bring intensity, energy, and loudness to countless top 40 hits with its renowned IRC — (Intelligent Release Control) technology. Ozone 7 Elements brings this same processing with simplified controls so you can get your tracks up to a competitive level while retaining punch and detail.